As the title say... Post a picture of the desktop you have on your daily driver. 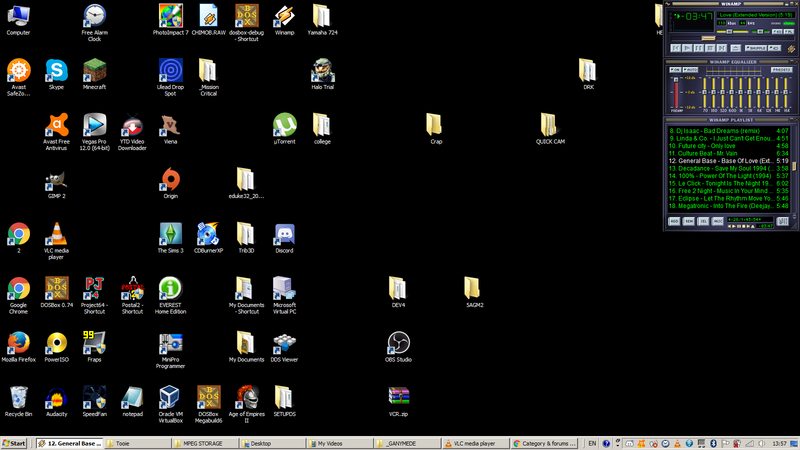 First picure is the desktop, modded for my viewing pleasure. Second picture is the command-line/console with a custom background. It's a total mess, I don't care. The second monitor, the top right square, is used to either monitor audio or to preview video, it is the only LCD in use here for the purpose of fixing color and such, it lets me see what most everyone else will see as I'm using CRT screens otherwise. Oddly the mouse is really difficult to get up to the second monitor, that overhang is quite large but only a tiny area towards the middle of it can snap the mouse to the other display - and it does snap, as often do windows if dragged over - so who knows what that's about, it isn't a problem going the other way. Equally annoying is how the system keeps deciding that this is Monitor 1 and displaying the POST and Login screens there as well as messing up the desktop icons. This is of minimal concern, however, as the system is rarely turned off anyway. Traditionally I'd just post a shot of DOS in these threads, but it seems pointless here. I still technically didn't break from my tradition though. Well... I can only speak for my self. Untill I switched, I have been a Windows user, only fiddeling with Linux for the sake of learning it. Never liked any Windows, post Win7, and as Win7 dies in 2020. I need to be ready for something different. Location: Hell Second monitor is enabled only when I use it. This is my first Arch Linux install so its kinda messy. Location: Hull, UK I just realized, that top picture of the futuristic city, I used to have that one set on the Dell XPS for a while, but changed it to a shot from Blade Runner. They should never have cancelled Farscape, it had at least one series left in it, I swear. Obviously this means the system has swapped names with the Deskpro, I'll think of something for that later. Could go without, really, the C&T doesn't have a NIC as there's no room for one, not a problem as there's nothing too huge to transfer and InterLink is more authentic I guess, that's what you'd have done back then.